We’d love your help. 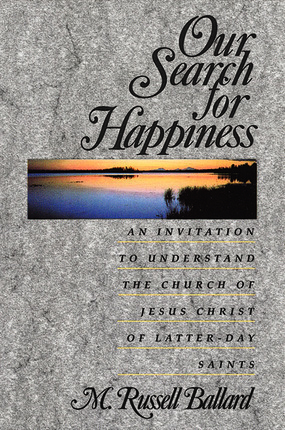 Let us know what’s wrong with this preview of Our Search for Happiness by M. Russell Ballard. To ask other readers questions about Our Search for Happiness, please sign up. I liked this book because it gave me food for thought. It was recommended to me by some Mormon friends as I was interested in their religion. It has led me to explore the Church of Jesus Christ of Latter Day-Saints in more depth. There were places where I had to stop reading in order to contemplate what I read and times when I thought I was not going to finish because of what I read, however it would nag at me and I had to pick it up again. Powerful. I really enjoy learning about different Faiths. Over the last couple of years I have made many friends who are Mormon. I admittedly do not know very much about the Mormon faith. A dear friend who is LDS has been answering my questions and sent me this book. It has been a great help in understanding her beliefs and the religion better. A really good overview of the restored church and the ultimate search towards happiness. This book has been on my to-read-eventually-when-I-feel-like-it shelf. Three days ago I saw it sitting there and had the prompting to pick it up and start reading. It was a quick yet powerful read. I am currently waiting on my mission call and doing everything I can to be prepared to serve. I can say this book has been a wonderful preparational tool and I'd advise anyone preparing for a mission to read this. It is written especially for those who aren't members whether they are interested in the This book has been on my to-read-eventually-when-I-feel-like-it shelf. Three days ago I saw it sitting there and had the prompting to pick it up and start reading. It was a quick yet powerful read. I am currently waiting on my mission call and doing everything I can to be prepared to serve. I can say this book has been a wonderful preparational tool and I'd advise anyone preparing for a mission to read this. It is written especially for those who aren't members whether they are interested in the church or simply want to understand members better. I can totally see his simple yet eloquent explanations being helpful to missionaries who are having trouble finding a good answer to certain questions that an investigator might ask. Synopsis: This book serves as an introduction to The Church of Jesus Christ of Latter-day Saints, written by an apostle of that Church. Elder Ballard discusses the beliefs that members of the Mormon Church have in regards to the apostasy, the restoration of the Gospel, the Book of Mormon, the plan of salvation, the Articles of Faith and missionary work. My Review: This book is a near perfect introduction to The Church of Jesus Christ of Latter-day Saints. It should be required reading for member Synopsis: This book serves as an introduction to The Church of Jesus Christ of Latter-day Saints, written by an apostle of that Church. Elder Ballard discusses the beliefs that members of the Mormon Church have in regards to the apostasy, the restoration of the Gospel, the Book of Mormon, the plan of salvation, the Articles of Faith and missionary work. A basic practical introduction to the beliefs and practices of the LDS church (Church of Jesus Christ of Latter Day Saints, aka the Mormons), for members and nonmembers alike. A quick, pleasant read with some stories and principles that will stick with you regardless of your religious persuasion. A good book for non-Mormons who only want to know what we believe but have no particular interest in converting. Easy read. Next to the scriptures, this little gem of a book is probably the most profound and concise explanation of beliefs held by Latter-Day Saints. It's explanations are simple, clear, and carry with them a unique sense of truth. I recommend this to everyone, whether they only seek to understand their Mormon neighbors, coworkers, and friends or are struggling to find the meaning to life. A great read for both those who do and do not belong to the LDS religion. Elder M. Russell Ballard does a marvelous job of explaining the doctrines of the LDS religion so that one who has never heard of the faith can understand its many intricacies. On the other hand, one who is a life-long member can still learn things that they did not know about before. Not what I was expecting from the title (though, the subtitle clued me in, so it wasn't a total surprise as I read it). However, I found the text a short and simple, yet powerful overview of my faith. I particularly enjoyed the examples from Elder Ballard's own life and his ending testimony. This is a great book for someone trying to get a basic understanding of Mormon beliefs. Written for individuals who are not members of the Church of Jesus Christ of Latter-Day Saints (the Mormons), the book does a good job of summing up our beliefs and explaining why we believe what we do. I highly recommend this book to anyone wondering about the basic beliefs of The Church of Jesus Christ of Latter Day Saints. If you are to study a faith, it is best to learn about it from its' members, rather than those who mock it. This is an excellent book portraying why members of the Church of Jesus Christ of Latter Day Saints believe what they believe in a way that is understandable to the general public. I like how it doesn't push the readers to believe what we believe, but simply increases understanding, thus promoting peace and love between different belief systems. Excellent book for someone looking to understand the Mormon Faith. This book provides fair insight into what makes the LDS church different from others. Highly recommended for anyone to read, LDS or not. This was a great book and a very quick and easy read. I would recommend anyone who in curious about the LDS faith, or who recently join the LDS faith, to read this book. I really like this book for a few reasons. 1. It gives more of the LDS world view not just what we believe but why. 2. He gives a more detailed history not just of the Church but of the Gospel of Jesus Christ. Even though the Church is only a hundred or so years old the teachings and authority are much older than that and this is why it is a "restored" Church and not just a regular church. 3. Even if you don't want to read it all the Chapter on the apostasy from Christ's time up until Josep I really like this book for a few reasons. 3. Even if you don't want to read it all the Chapter on the apostasy from Christ's time up until Joseph Smith is well done and easy to understand. But the book itself is a quick read so you do not have to invest so much time into it. 4. He takes risks with the reader and does not back down from our beliefs but I think he does it in a loving way trying to help others understand that when you believe in something strongly there is always risk others with disagree and that is OK.
5. I also like how Ballard invites anyone who is trying to understand Mormons can write him at his office, he gives the address to reach him at the end of the book. In today's world many not of the Church of Jesus Christ of Latter Day Saints seem to be seeking for further light and knowledge even bits and pieces of faith related matters that will aid in their understanding of Gods will for us. It is not uncommon that many of these beloved sons and daughters of God have an ever increasing desire to know in greater light what they may do to follow the example of the Savior in serving their families and friends while here in mortality. After all that is part o In today's world many not of the Church of Jesus Christ of Latter Day Saints seem to be seeking for further light and knowledge even bits and pieces of faith related matters that will aid in their understanding of Gods will for us. It is not uncommon that many of these beloved sons and daughters of God have an ever increasing desire to know in greater light what they may do to follow the example of the Savior in serving their families and friends while here in mortality. After all that is part of our purpose here on the earth to see if wee shall do all things that the Lord commands us and thereby inheriting that Degree of Glory each of us is seeking. A great little book whose goal is to help you in the understanding of the beliefs of followers of the Church of Jesus Christ of Latter-Day Saints. The author doesn't state he isn't seeking conversion of non-member readers but does ask them to take a moment at the end to seek God in the truth of the content provided. The author has a wonderful way of combining personal experiences along with doctrine, which breaks up the dry tone at times. At the same time the reader receives his testimony and a A great little book whose goal is to help you in the understanding of the beliefs of followers of the Church of Jesus Christ of Latter-Day Saints. The author doesn't state he isn't seeking conversion of non-member readers but does ask them to take a moment at the end to seek God in the truth of the content provided. The author has a wonderful way of combining personal experiences along with doctrine, which breaks up the dry tone at times. At the same time the reader receives his testimony and a much easier breakdown like the discussion of the Articles of Faith. I continue to believe that faith-real faith, whole-souled and unshakable-can be as important to a healthy, balanced life as a sturdy anchor to a ship bound for the open seas. A good book to explain some of the basic beliefs and practices of the LDS (aka Mormon) Church. I can see and I agree with why this is part of what we call the Missionary Reference Library. I think what I enjoyed most was listening to the audio, for it was read by the author and I never tire of listening to the prophets' and apostles' voices. Definitely recommended to those (especially my friends) who are curious about my beliefs--reason being the point of the book: to help them understand more of A good book to explain some of the basic beliefs and practices of the LDS (aka Mormon) Church. I can see and I agree with why this is part of what we call the Missionary Reference Library. I think what I enjoyed most was listening to the audio, for it was read by the author and I never tire of listening to the prophets' and apostles' voices. I absolutely loved reading this book. While it was mostly written for the purpose of educating those not of our faith, I feel that I also gained much by reading it. Though I didn't necessarily learn anything new, I loved the sweet and simple testimony that Elder Ballard shared. I could feel the truth of his words and the Spirit that they brought with them. This would be an excellent resource to share with anyone looking for more information on The Church of Jesus Christ of Latter Day Saints. Eld I absolutely loved reading this book. While it was mostly written for the purpose of educating those not of our faith, I feel that I also gained much by reading it. Though I didn't necessarily learn anything new, I loved the sweet and simple testimony that Elder Ballard shared. I could feel the truth of his words and the Spirit that they brought with them. In this world we live in, individuality is one of the largest and wide spread religions. Men and women spend much, if not most of their time learning about, shaping, presenting, and defending their own individuality. This often places people on a self-righteous moral high horse. This attitude amongst people dilapidates hundreds of year of trying to build human love and unity. This is a book focuses on building cross cultural understanding and cooperation. He was born to Melvin R. and Geraldine Smith Ballard. He attended the University of Utah. He served as a counsel President M. Russell Ballard has served as a member of the Quorum of the Twelve Apostles of The Church of Jesus Christ of Latter–day Saints since October 6, 1985. He was set apart as Acting President of the Quorum of the Twelve Apostles by President Russell M. Nelson on January 14, 2018. He was born to Melvin R. and Geraldine Smith Ballard. He attended the University of Utah. He served as a counselor to the president of the British Mission. He has been a bishop twice and a high councilor in two stakes. In 1974, he was called as president of the Canada Toronto Mission, where he was serving when he was called to the First Quorum of the Seventy in April of 1976. He served as a member of the Presidency of the First Quorum of the Seventy from Feb. 21, 1980, to Oct. 6, 1985. Prior to his call as a General Authority, Elder Ballard had interests in automotive, real estate, and investment businesses. He has served on many civic committees and boards. He is the author of two books.